...well, in the words of the immortal Groucho Marx, "Why not a Flounder?". Seriously, though (or as serious as one can be when discussing a topic like this), the Flounder is a self-portrait; Ive been a Flounder since early 1971. Truth: I do a cartoon series documenting the adventures of the residents of 610 Kirtland Street (both of them), which has been ongoing for about that long, of the Adventures of The Little Gray Cat and The Flounder. The cartoons are generally incomprehensible except to our closest friends, and occasionally incomprehensible even to us (I still dont know what the "A-Frame Whale" was, but we have a picture of one). So Now You Know. Unfortunately, Knowledge is not Understanding. But since we don’t know where the Flounder concept first came from, we can’t help much. You can see some of the many Flounder and Gray Cat cartoons from my humor page. When I needed a company logo, I asked an artist/designer friend to create one based on The Flounder as a theme. The company logo is a pun on a fish in a fishbowl and a fish with a bright idea. The more perceptive have already discovered that the bulb has left-hand threads (I didnt notice it for the first ten years I had the logo; the artist who designed it from my Flounder illustration understood art better than she understood light bulbs). But there are days when I feel like a left-hand-thread in a right-hand-threaded world. 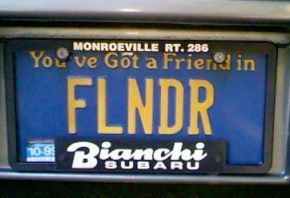 The Flounder identity is deeply rooted; my car has a vanity plate FLNDR; Ive had people who havent seen me in a decade call out to me at Comdex "Flounder!". In one case, the caller admitted that he remembered "Flounder" before he remembered "Newcomer"! Many years ago, I had a thousand "Flounder Nickels" printed up. These are traditional "wooden nickels". The front and back are shown at the left. Do you understand the symbol on the back of the coin? Before looking here for the answer, try to figure it out...all the clues you need are in the picture. I should not be confused with the character "Flounder" from "Animal House", a movie that came much later (1978) than the time I became a Flounder (1971). I've never seen the movie, but was asked by a fan of his to create a link to his site. I am also not the Flounder of flounder.net. And while the game Phlounder precedes me (1962) I did not know it existed until a friend purchased a copy for me at a yard sale in the mid-1980s. I am also unrelated to the book The Flounder by Günter Grass. Copyright © 1998-2003, The Joseph M. Newcomer Co.